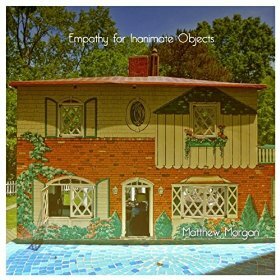 Chicagoan Matthew Morgan opens his album, Empathy for Inanimate Objects, with the lilting, plinky, countrified, modern sound of “Songs Like These.” The man’s obviously strong and distinctive vocals are present from the beginning here as they are on all six songs (as is the slight Angelo Badalamenti-meets-Daniel Lanois background touches often heard throughout). On “Hold On I’m Comin’” we get Liz Chidester’s vocals mixing with Morgan in the chorus and a big stompin’/chunkin’ beat during a very singable chorus. Chris Bosca’s lap steel is pretty perfect here as well. “SticksNStones” is a slow missing-one’s-love song, again with a big, singable chorus informed by Chidester and Morgan’s mix; there is that atmospheric roil of the layering of instruments here too and even a lead whistle part. “First Day” has a plunky beat to it with Bosca managing the national resonator guitar and David Szpunar’s accordion in this slowly evolving character sketch. Sarah Blick’s violin is understated in the mix as well. Once again Morgan manages a cozy little gem of a tune with his singing over just the perfectly produced bed of sound. We are back to that echo guitar with ender “When You’re Gone.” Morgan has a very strong voice here especially and when Nate Lockwood comes in on percussion and Szpunar on banjo, what becomes the best song of the grouping opens up to a little masterpiece. Matthew Morgan’s Empathy for Inanimate Objects will get you quickly intimate with this strong songwriter’s talent.